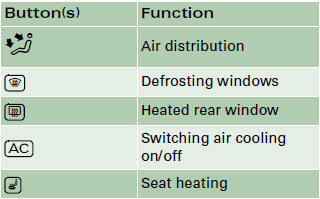 • The air conditioner operates most effectively with the windows and the tilting panorama roof* closed. However, if the vehicle has heated up after standing in the sun for some time, the air inside can be cooled more quickly by opening the windows for a short time. 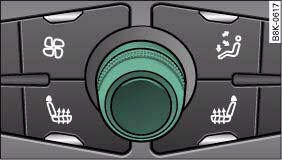 The functions can be set by turning the rotary control and are switched on and off by briefly pressing the buttons. The LEDs in the buttons light up when the function is switched on. The grille on the control console, fig. 103 must be kept free. Please ensure that it is not covered by stickers or similar. Measuring sensors are located behind it. 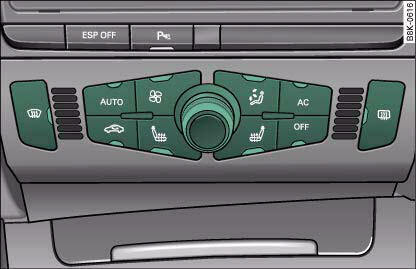 – Press the OFF button to switch off the air conditioner and cut off the supply of fresh air from outside the vehicle. 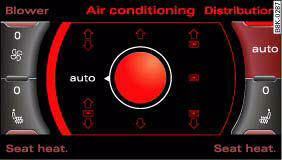 The air conditioner will switch on again if one of the control buttons is pressed. 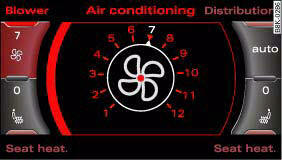 – Turn the rotary control anti-clockwise to reduce the temperature or clockwise to increase the temperature ⇒ fig. 104. 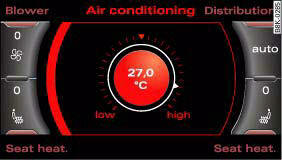 The temperature setting will be shown on the screen ⇒ fig. 105 for a few seconds if the sound system or MMI* is switched on. 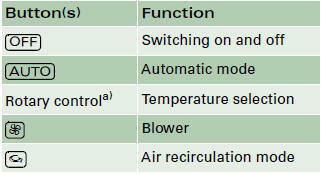 The automatically selected blower speed can be reduced or increased manually if required. – Press the button for the blower . – Turn the rotary control to set the blower to the desired speed (and regulate the volume of air delivery). We recommend keeping the blower running at a low setting when driving slowly. 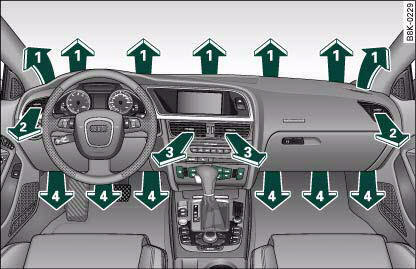 To prevent fumes or unpleasant smells from entering the vehicle, switch to the air recirculation mode by pressing the button. The blower speed will be shown on the screen, fig. 107 for a few seconds if the sound system or MMI* is switched on. • The blower speed may change automatically. This ensures that the selected temperature is reached as quickly as possible. • The blower speed cannot be regulated separately for the driver and front passenger sides of the vehicle. – Press the button ⇒ . When driving through a tunnel or in queues of traffic, to prevent fumes entering the interior of the vehicle. For reasons of safety you should not leave the air recirculation switched on for too long. 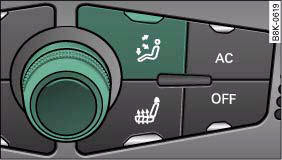 This mode prevents fresh air from entering the vehicle, so the windows can mist over if the air cooling is switched off. Bad visibility can cause an accident. The air distribution setting will be shown on the screen, fig. 109 for a few seconds if the sound system or MMI* is switched on. – Press the button again. 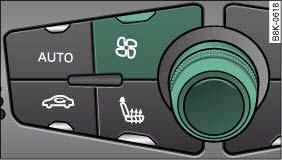 – Switch off the cooling mode by pressing the AC button (LED off) if you wish to save fuel. – You should also switch off the cooling mode by pressing the AC button (LED off) if you open the windows or the tilting panorama roof* while driving.